It’s a no brainer; if you are going to ride a scooter or bike, you need a helmet. It’s as simple as that. Helmets will not only protect your head from the impact of falling, but also prevent any projectiles from hitting your head. It is recommended that you change your helmets every 3 to 5 years, depending on use. Even if you have not suffered from a fall, a simple crack on your helmet may jeopardize its ability to protect you. So, whether it’s time for a change or you just want to switch it up, check out these helmets. Light and comfortable, this helmet has ergonomic interior padding for added comfort. The carbon fiber outer shell is lightweight but durable, with micrometric closure clips for locking and unlocking. To add, that retractable smoked visor is a nice touch, as it gives you the option to go with or without. Perfect for days when you just want to cruise along a bright, blue and beautiful day. 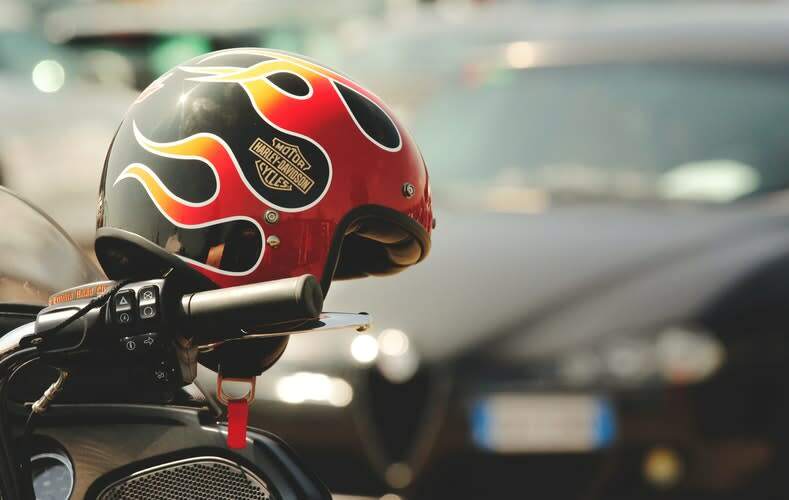 There are so many factors that this Korean motorcycle helmet maker takes into consideration, eventually making this top of the line helmet the best. The helmet has many of their signature innovation, such as AirFit inflatable cheek pads for precision fitting and Pinlock MaxVision anti-fog visors for a fog-free vision. Most importantly, with the new TCT Technology (Thermo Dynamical Composite), this extremely light weight helmet is also extremely safe and secure. On impact, the smart shell is able to gradually crumple to absorb most of the shock whilst retaining one of its strongest structures. Some reviewers have even claimed that this is the lightest full helmet with internal sun visor in the market, so check it out and see for yourself. Vespas are classic, and with that, you have to keep up with the image. This handcrafted shell brings back retro designs, colour and a rear goggle holder to match. The ¾ designs gives you some freedom while riding but also protects your ears from much of the noise pollution while on the road. HJC have been producing helmets since 1971 and is among the first helmet companies to sponsor a MotoGP event. All children grow at different rates, thus each helmet may fit each child differently regardless of their age. To make sure it is fitted well, ensure that a helmet is fitted snugly on the child's head but not too tightly. The straps on this helmet should fit comfortably on their chin, staying secured with little to no movement whenever movement is made. Using PP material with a buffer layer of EPS material, this helmet is built to protect. Electric scooters are best for cruising short distances within cities. It gives us a sense of freedom, which is why half helmets are perfect. Still giving you optimum protection, this half helmets gives you an open-air feel. One that will let you enjoy the wind in your face. Not in it for the speed but just want to enjoy the ride? Mopeds are a type of motorcycle with an engine capacity of 50cc and below that can go up to 60 km an hour. It’s mostly for those who enjoy cruising short distances. In this case, a half helmet is suitable in this instance. This helmet comes with removable cloth ear protectors, that can be zipped and unzipped to your liking. Enjoy the wind in your face to the sounds all around you. With sleek edges to give it a slimmer less chunky look, this helmet is the ideal lightweight helmet for female riders. The multi-stage air intake ensures a constant airflow that flushes heat and humidity out of the helmet, while the face shield offers 95% UV protection. To top it all off, the one-touch integrated smoke-tinted sun shield does exactly what its name implies, by quickly deploying or retracting the sun shield right before you speed off into the sunset. A full-face helmet with a protective visor for when the winds get too much, this helmet comes in a selection of sizes for one that’ll fit you best. The visor is made of polycarbonate resin with UV 380 anti-scratch and is designed to be removed without any tools. As you are exposed to the elements through the open face design, the cheek pads are removable and machine washable. Constantly stuck in a daydream.